These Embroidered Teal Ribbon Press & Apply Appliques have a self-addhesive backing which allows you to just peel & stick on clothing, name badges and more. They are ideal for use as an inexpensive fundraiser or can be mailed to members and contributors. *Quantity discount pricing for both 1" and 1⅜" sizes. 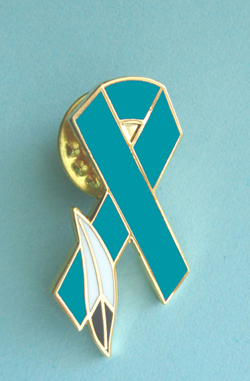 Also available see our 2" Teal Ribbon Stickers, rolls of 1,000 only $53.95 per roll. White 2" stickers with Teal Ribbon imprint. Roll of 1,000 stickers only $53.95 per roll. See info page for quantity discounts.